WordCamp Moscow 2016 was held this weekend in the amazing Digital October Center. Fourteen speakers from Russia, Ukraine and Lithuania, two tracks with great content on design, programming, blogging, business and of course SEO. Huge props to Dmitry Mayorov for taking on the lead organizer role and making the best out of it. We had a little over 200 attendees this year, and the event was quite a success. 92% of the survey respondents said that the event was “great” or “good,” and only 8% said it was “okay” or “could be better.” Nobody said it was awful, so that’s a win. A fair amount of new speakers applied this year, in fact, five of them never spoke at a WordCamp before. The overall survey results (speakers and their talks) were good. Not amazing, but good. We decided to divide up the two tracks by “anticipated popularity” this year, rather than by content, which I think worked out really well, although some attendees complained in the survey. A small number of attendees didn’t like some of the talks because they were “too basic” or “too vague.” Well yeah, that happens. The breaks were long, as usual, pizza for lunch, better-than-last-year coffee, fruits and snacks. We even had a lovely press wall this year, with the conference and sponsor logos, which attendees (and photographers) really enjoyed. The sponsors area was much more active this year, with all four of our platinum sponsors having their own table or booth. The after-party was in a cafe/restaurant in the same building, where luckily this year we were able to negotiate a cheaper selection of beers, juices, waters and wines for our pre-order to fit our budget, so we didn’t run out as quickly as we did last year. 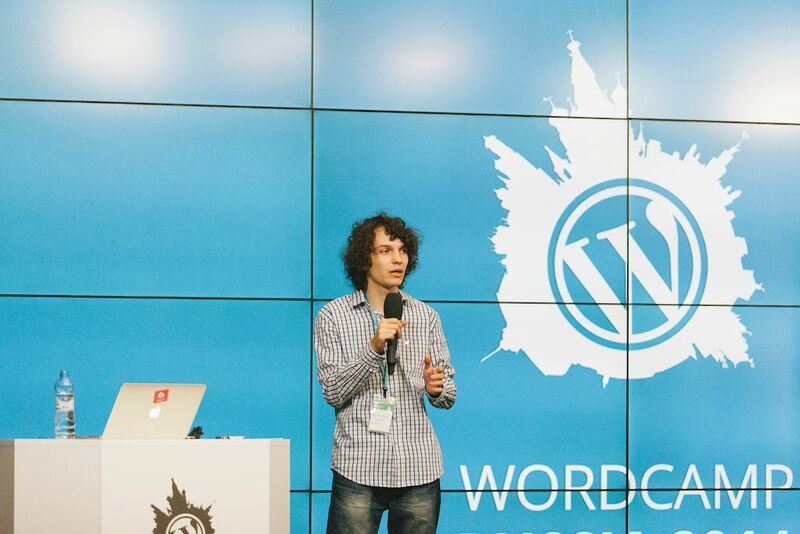 Besides being on the WordCamp Moscow organizing team, I was also a speaker. My talk was about memory management in WordPress and why increasing the PHP memory limit is a bad idea. It was targeted at advanced users and developers, though beginner users were also happy to hear they shouldn’t get a more expensive server if their memory consumption averages around 90%. The slides are available on SlideShare, the video will be up on WordPress.tv around September. Again, thanks to Dmitry Mayorov, the WordCamp Moscow 2016 organizing team, all the speakers and volunteers, for making such a great event. I really hope that attendees from other cities and countries were inspired enough to create their own WordPress meetup group, and start working towards a WordCamp in their area. 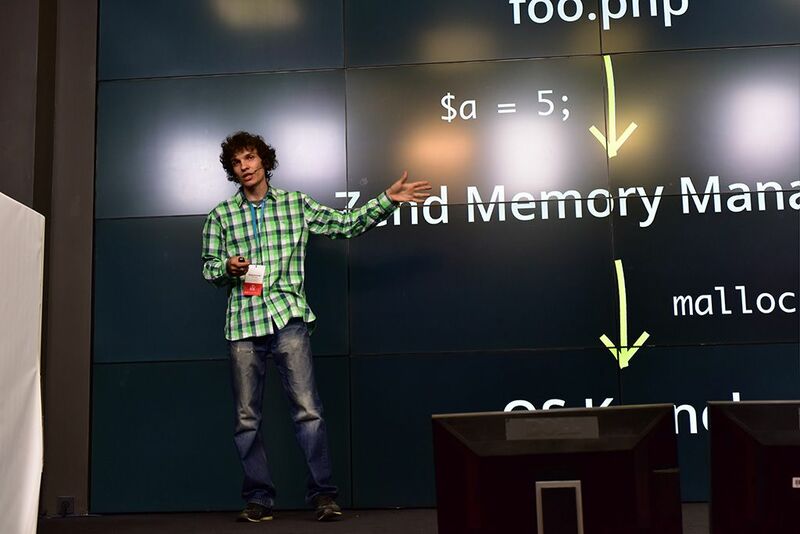 WordCamp Russia 2015 was held last weekend in the amazing Digital October Center in Moscow. Attendance didn’t change much from last year — we saw about 200 people in person, but a lot of them (~ 60%) were folks who never attended a WordCamp before. The attendees survey showed great results, pretty much in line with last year and with what we expected overall. The pizza was good, the lounge music was praised, the presentations were terrific. One thing that stood out was a gentleman, who for some reason decided that it was okay to jump up on stage during a presentation, and point out some (supposedly) mistakes that the speaker had made in their code. Awkward. I guess we’re going to have to hire a bouncer next year. Big thanks to the organizing team, all the volunteers, speakers and sponsors who made WordCamp Russia a success! This past weekend I participated in my first Capture the Flag challenge which was hosted by Matt Hamilton (Eriner) and other folks of the OTA Team. It was an epic 72 hours. We teamed up with my brother and took 5th place. During those 72 hours I learned a lot more than I knew about steganography, cryptography, filesystem superblocks, and even got to sharpen my math skills. I must admit I knew nothing (or maybe forgot everything) about calculus. My favorite challenge was cracking an Enigma-encoded message. It turns out that the military version of this 1920s machine has over 158 quintillion (!) different ways to setup the initial key. My first blind attempt at bruteforcing it yielded only one million combinations in about 10 minutes. Yeah, good luck with that. 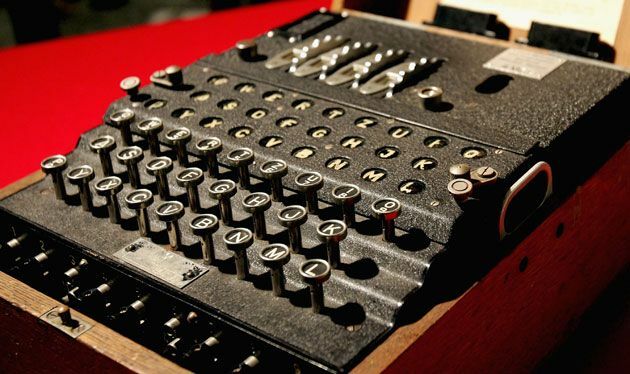 Luckily there are much more effective algorithms to crack the message in fewer steps (yes, faster than the Turing Bombe), by relying on quadgram statistics, given that we know the language of the original message. Thanks to the OTA Team for hosting this online event! If you’re looking to join such an event in the future, check out ctftime.org. One feature I was particularly excited about in Twenty Fourteen is the “accent color” which lets you personalize your theme by changing the default green to whatever you like. Unfortunately the feature was removed in #26220, mainly due to the fact that it allowed users to make bad choices, like using a color with a bad contrast, rendering their website ugly and unusable1. I’ve been thinking about this a lot after that commit, and even more lately. Many themes come with color options these days and the vast majority suffer from the very same problem — poor user choices. I can’t say I love Weaver’s default look and feel — it’s okay. But it’ll only take a few minutes for an average WordPress user to completely ruin it without even knowing it. Then again, Weaver is a pretty popular theme on WordPress.org and if I had to guess why — it’s the amount of freedom it gives its users via theme options. But that freedom comes with a price. And I’m not talking about the theme’s pro version, no. I’m talking about the risk users take unknowingly. The risk that could result in poor usability, ugliness and insanely high bounce rates, even if the site looks “just perfect” to the owner. So how can we protect our users from poor decisions, while still giving them their beloved color options? Providing a predefined set of color schemes is one way of doing it, but this post is about something different. You’re probably already familiar with CSS preprocessors, so here’s an interesting piece on accessibility and contrast with Sass and LESS. You can use brightness() or lightness() to help you choose better contrasting colors. You can use darken() and lighten() to alter your colors for better contrast. You can take it a step further and calculate the color luminance and contrast ratios. But building your WordPress theme stylesheet with Sass or LESS is one thing. Providing users with an option that could somehow magically change and recompile your CSS is another. One way is to bundle a Sass or LESS PHP-based compiler inside your theme, though I’m not sure if the folks over at the Theme Review Team would be very happy about that. Where you get the rest of the Sass code is entirely up to you. You can store it as a string in a PHP file, you can query the file system for the actual Sass file (note that Theme Check won’t let you use file_get_contents()) or you can even wp_remote_get() it, perhaps as a fallback if nothing else works. Sass and LESS compilation can take a while, especially when you start using math functions like pow() or nthroot() (you’ll need these for luminance), so make sure you’re not compiling your stylesheets on the fly on every single request. Instead, you can grab a hash of the color choices, and perhaps the stylesheet version, and cache the compiled CSS forever in a theme mod, and if the colors are changed, you’ll simply overwrite the cached entry. Semicolon is a magazine theme I released earlier this year. It was built with Sass already, so I simply extracted all the color definitions from the main stylesheet into a new colors.scss file, and then used some basic regex to inject user color values and recompile the stylesheet with Jetpack. I also added automatic contrast correction which is on by default. So if the user picks bad contrasting colors, Semicolon will lighten or darken them until a contrast ratio threshold is reached. This guarantees a certain level of readability, even if it means drastically changing the user colors, like yellow to almost brown. Which I don’t think is bad, but it will certainly surprise many users. I guess a little tooltip message about why they’re not seeing the colors they’ve picked could help them understand what we did there. You can grab the theme from WordPress.org or browse the theme code on GitHub. The Sass magic lives inside css/colors.scss and the compilation and caching code is in functions.php (custom_colors() method). It’s not meant to be perfect, but I think it’s a good start. Give it a spin and let me know what you think. You’ll need Jetpack’s Custom CSS module active. If you’re working locally, you’ll want Jetpack’s development mode. I appreciate your thoughts and comments! 1. There’s a neat plugin for the default Twenty Fourteen theme called Fourteen Colors, which also adjusts contrasts using PHP. Funny thing happened today. My car insurance expired, so I called my insurance company (RESO) from my cellphone. Nobody answered my call, it was Friday evening after all, so I hung up and decided to call them on Monday. For those of you who can’t read Russian, it’s an advert from INHELP, a different insurance company offering its services. The message came from PROMO — the official MegaFon advertising channel. At first I thought it was a coincidence, so I asked my wife to dial the same number and moments later she gets the exact same text advert! I wouldn’t consider this a big deal if I had registered on some website online and given them my phone number. I would actually expect them to sell the number to third-party advertisers, but this is different. Here’s what I think: MegaFon Moscow, one of the three largest network operators in Russia, is not only selling my phone number to advertisers, but also the fact that a phone call was made to a certain number. At this point I wouldn’t be surprised if a recording of the phone call was also handed over. The second WordCamp in Russia was a success, with almost 200 attendees and a great lineup of 14 speakers from all over Russia and abroad, including Ukraine and even Germany. I’m not going to go into much planning details like I did last year. Everything was mostly the same, with the exception of having almost twice as many speakers, two tracks, pizza for lunch, a new logo (which everybody thought was a splash), as well as little irritating things that made planning more stressful — like the absence of parking spots close to the venue, problems with shipping anything from the US to Russia, and the fact that we bought about 10x more coffee than we ended up serving. In any case, the post-WordCamp survey showed a 96% satisfaction rate, which definitely works for me. Now back to reading those new 4.0 commits, and still struggling for inbox zero, even though it’s been over a week now. 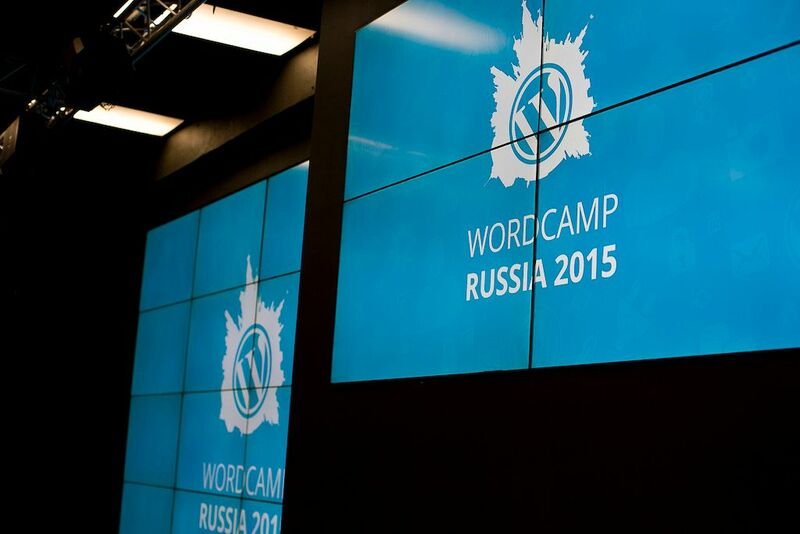 Photos from WordCamp Russia 2014 are on Facebook. Slides from my talk about scaling WordPress can be found here, the videos from all the sessions should appear on WordPress.tv in a few weeks. Last year we had a blast and this year we’re planning to have an even bigger one. 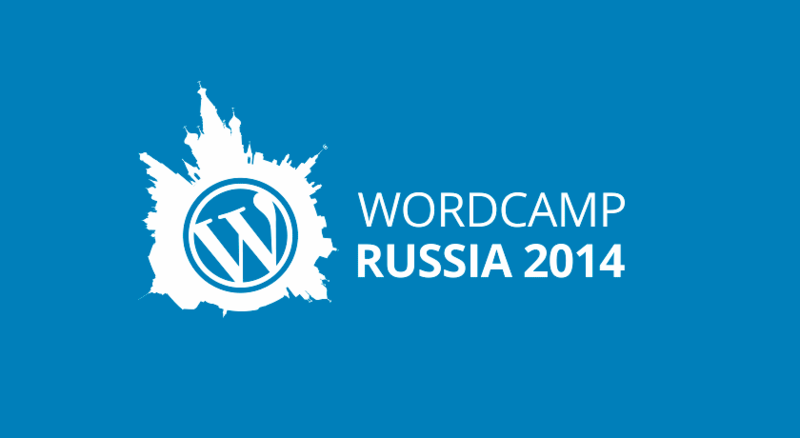 WordCamp Russia 2014 will be held on August 9th in Moscow. We have a line up of 14 speakers ready to deliver some WordPress awesomeness in two simultaneous tracks, at the popular Digital October conference center in Moscow. Tickets are available at $20, which includes a full day of learning and networking, food, coffee breaks, after-party and of course swag. See you in Moscow!